Figure. The patient’s rash at presentation. A 14-year-old boy presents with a slightly tender rash on both lower legs a week after an attack of tonsillitis (Figure). He had been previously well. What is the most likely diagnosis and how should the patient be managed? The most likely diagnosis of this patient’s papular purpuric rash, classically known as palpable purpura, is cutaneous small vessel vasculitis. 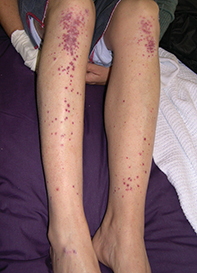 Most patients present with palpable purpura on dependent areas such as the lower legs, but urticaria, blisters, purpuric plaques and blisters can also occur. Symptoms of the rash itself are usually minimal, but the presence of any accompanying systemic features such as fever, arthralgia, myalgia, nausea, vomiting, headache and photophobia should prompt immediate investigation for a serious systemic cause. There are many possible causes of blood vessel inflammation. The aetiology is related to circulating immune complexes. About 20% of cases of small vessel vasculitis are related to medications and 20% to infections – particularly group A streptococcal disease and, much less commonly, meningococcal infection. Other causes include inflammatory diseases, some of which are potentially serious, such as Henoch–Schönlein purpura and Wegener’s granulomatosis. In approximately 50% of cases of small vessel vasculitis no cause can be found. In this patient’s case, it is probable that pre-existing streptococcal tonsillitis was the trigger for the reaction. Although small vessel vasculitis is a clinical diagnosis, a skin biopsy will confirm it. Immunofluorescence staining will confirm Henoch–Schonlein purpura by demonstrating IgA in the vessel walls. • complement C3 and C4 levels. For a patient who is unwell, a full infection workup, particularly for meningococcal disease, should be performed. The patient should be referred to a hospital accident and emergency department for investigation and specialist review. Further investigations, such as hepatitis B and C serology and tests for further immunological markers, should be performed if there are abnormalities on basic tests. The prognosis of small vessel vasculitis ranges from a single event lasting a few weeks to a chronic or recurrent condition. When vasculitis is drug induced or related to an infection, no specific treatment is required other than cessation of the drug or treatment of the infection. When it is a symptom of serious underlying connective tissue disease then treatment is of the underlying disorder. For the 50% of patients in whom no cause can be found and there is no systemic involvement, treatment is symptomatic. Medications range from NSAIDs to immunosuppressants, including prednisone, azathioprine and methotrexate. Referral to a dermatologist, immunologist or rheumatologist is recommended for patients whose condition has not resolved within six weeks of acute onset.